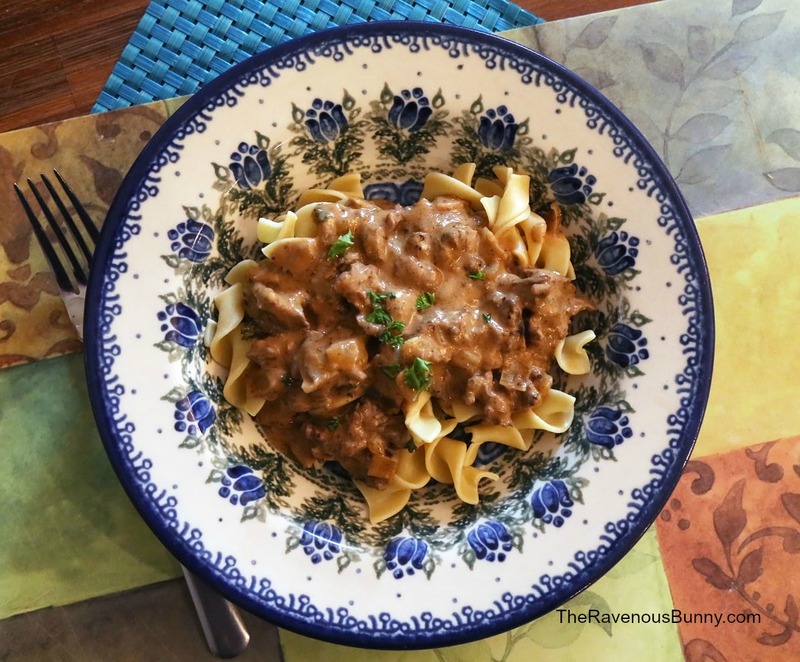 Beef Stroganoff is an old school Russian dish (with possible French influences) however it became popular in this country (or at least a version of it) in the 50’s. It’s not really very popular any more. Most of the recipes you see online for this dish involve using condensed cream of mushroom soup. This recipe does not. In fact I prefer this dish with rice instead of the egg noodles featured here but I was outvoted. Don’t expect subtle here, the flavors are simple but bold and the gravy is rich and luxurious. This is not a complicated dish. In fact, aside from the carb component (rice, noodles or potatoes) this is a one pan meal. You’ll notice this recipe only addresses the beef and gravy. I’l leave the carb component up to you. Make sure to allow time for that. If you’re making rice, do that first. If you’re using egg noodles, start the water boiling in the beginning and drop the noodles once the gravy is put together. If you want to use potatoes (mashed would be fantastic! ), get the potatoes boiling while you make the gravy. Tenderize the beef lightly with a meat mallet. Salt and pepper the beef generously. Spread 3 Tablespoons of mustard on one side of the beef. Cutting against the grain, cut into small, thin strips. You are wanting pieces slightly bigger than bite size. Once the beef is cut, sprinkle with flour and put in a hot pan (heated over medium high heat with 2 Tablespoons oil or butter). Sear the beef quickly, about three minutes. Don't walk away from it and watch your heat. It can burn easily so adjust your heat down if you think it is too hot. Remove the beef from the pan and set aside. Add 2 Tablespoons of oil to the same pan and add the onion. Cook for four minutes until soft. Reduce the heat to medium. Add the mushroom and garlic and cook for another 3-4 minutes until the mushrooms are soft. Add broth, tomato paste, butter, Worcestershire sauce, mustard and ground pepper. Mix until everything is well incorporated. Add the beef back in and heat through. Finally, turn the heat to low and mix in the sour cream. Mix well and let simmer for 3-5 minutes.